“I want to lose weight,” is not a goal. That 5 word sentence will not keep you motivated throughout the hours, days, weeks, and months it will take you to get to where you truly want to be. 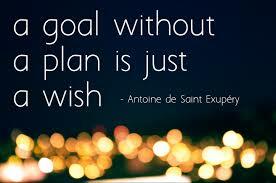 So, how do we set achievable goals? When setting goals we want to use the acronym S.M.A.R.T. You have to be able to track progress and see that you are moving forward. With all my clients we track body fat %, waist circumference, strength, energy levels and more. How do you know you are on the right track? One of the above is changing. Is your goal weight loss? Sometimes the scale doesn’t change and can be very frustrating, so we need to have other ways to see progress. Make sure you are capable of hitting your goals. When setting this goal I would make sure you are confident in yourself that you can make it happen. If you don’t have the right mindset going into this goal you will doubt yourself along the journey. Don’t pick a goal you know you can’t reach. Picking a goal of getting lean and mean for a beach trip in a month when you have 50 pounds to lose is not realistic. Set a date you plan to reach your goal. Personally, this one has been huge for me. If you have a deadline you will make it happen! If there is no time table I always find myself procrastinating. This might be the most important one of all. I talk to so many people that were so gung ho about whatever their goal was and to see them drop off and not have that finish line in their sights is so heartbreaking for me. So, what do you do after reading the above? Well, set a goal of course? What do you want? Like, reallllllly want? Use the above acronym to help set a course for your goal. Write it all out, make a plan and put it somewhere where you will see it every day to remind you. Like on your fridge or bathroom mirror. What else can help you reach your goal? If your goal you want to achieve is more long term than have short term goals as well. Small wins like this will definitely move you in the direction. At the end of the day it is about being consistent. So, like I said earlier if we have realistic, achievable goals we can slowly chip away at with weekly attainable goals we will get there. I have no doubt in you! Honestly, you definitely need a coach or accountability crew to keep pushing you. Take the guessing game out of how you should train and what to eat with a coach. And have a tribe of people you work out with and share recipes. Oh, and enjoy the journey! It’s a sweet ride! I hope this post helps you and if you need a coach or have questions please reach out.